Yorkshire will dominate the County Championship and win the competition for the "next five or six years", club president Dickie Bird says. 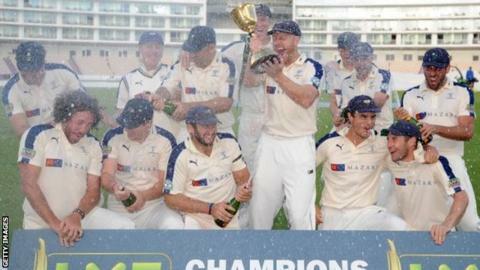 The side have already retained their title and end their Championship season this week with a home game at Headingley against Sussex. And 82-year-old Bird, who has been the club president for two years, expects the side to win more trophies. "We have some great youngsters coming through," he told BBC Radio Leeds. "We've had seven or eight Test call-ups this season and it has depleted our side, but the youngsters have come to the fore and done magnificently." The former Test umpire added: "I think this side can go on for the next five or six years and win the Championship because there's so much strength in depth. "It's a massive achievement and I feel very honoured, humbled and proud to have been the president." Jonny Bairstow, Gary Ballance, Tim Bresnan, Adam Lyth, Liam Plunkett, Adil Rashid and Joe Root.